In 2007, a hungry entrepreneur brought the popularity of California based burger chain In-N-Out to Utah. Only it wasn’t In-N-Out. It was called Chadder’s, and it was the fake Rolex equivalent of fast food. Chadder’s copied the same In-N-Out color scheme, same menu and allowed customers to converse using the same secret code words when ordering a burger with the works. 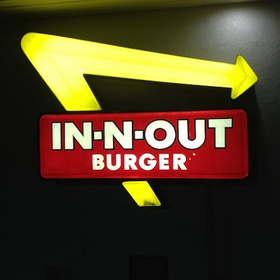 It didn’t take long for the word to get back to the real In-N-Out headquarters and a judge ruled against the doppelgänger burger joint. Chadder’s could keep flipping burgers, but they were forced to change their look, the names of the items on the menu as well as the way folks went about ordering their food. If a customer at Chadder’s ordered a burger “Animal Style,” the kid behind the cash register had to play like a deer in headlights and insist they didn’t know what the customer was talking about. After thousands of dollars in attorney’s fees and remodeling costs, the final fry in the deep fryer for Chadder’s came when In-N-Out decided to open up the real thing in Utah. The copycat clone quickly went under. This wasn’t the first or only company to try to “borrow” a rival’s successful business model. And they aren’t the only one to lose in court trying to do so; because a trademark is one of the most important ways that companies have to associate themselves with goods and services in the minds of individual consumers. In 2014 alone, the U.S. Patent and Trademark Office received 455,017 trademark applications, with even more expected in 2015. A successful trademark is one that is most likely to be remembered by consumers, because it inspires current purchasing and establishes a pattern of future buying. With that in mind, here are four of the most common trademark mistakes and misconceptions to avoid when trying to protect your business. This symbol is only considered a “common law” trademark, and its sphere of influence is limited to the immediate geographical area in which your company operates. Any other company that applies for federal protection using the exact same trademark will have full domestic protection, and your company will be left on the short end of a legal hassle if you fight for continued usage of the original trademark. Avoid this situation by registering your trademark immediately. A trademark phrase such as Uptown® Potato Chips does not have the entire phrase trademarked, but it is still 100 percent distinctive from other brands of potato chips because the “Uptown” portion of the phrase is not used by any other company. The two words “potato chips” cannot be trademarked because they are generic terms used to describe a product, however “Uptown” is a federally protectable trademark using an arbitrary sense to identify the source of the potato chips. As a matter of fact, trademark applications which merely describe goods or services are the single most common reason for rejection by the U.S. Patent and Trademark Office. Competitors are entitled to describe their goods or services, and generic phrases rule out that possibility. The simple correction to this mistake is to add some kind of term (like “Uptown”) which is unique to your business. Because trademark protection is broken down into categories of goods and services, your company may have a valid trademark with full protection on one class of goods, but not on another. If a company with similar goods or services wanted to trademark their version of the same products, it would not be contestable unless your goods and services were deemed to be related to each other in such a way that usage by any other company would result in commercial confusion between the two companies. One reaction to this regulation might be for a company to list every product imaginable under its trademark application when submitting to the Trademark Office, but this is likewise illegal. Every individual product or service listed under a trademark application must actually carry the company trademark, or the entire registration application will be considered invalid and will be revoked upon discovery. Any trademark bearing the ® symbol declares to the world that the owner has successfully applied for and obtained a trademark grant from the Trademark Office. It does not mean that the company has applied and the approval process is underway; approval must be formally acknowledged by the Trademark Office before the symbol can be used in legitimate commerce. By contrast, the “TM” symbol is not granted by federal approval and is considered a common-law trademark which is meant to convey the notion that your company claims exclusive rights on a given product or service. This symbol can be used at any time, free of governmental regulation. With trademarks carrying so much importance in today’s global business environment, knowing how to correctly protect your names and logos is essential. Applying these four tips can save your business a lot of time and money, if not save your business entirely.